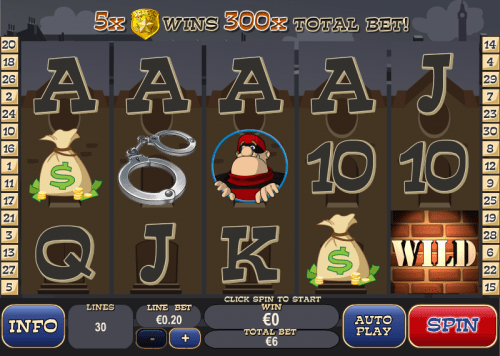 Cops 'n Bandits is a 5 reel and 25 payline slot game produced by the software developers at Playtech. The game has a heist theme that is quite common in online slot games. Cops 'n Bandits follows the schemes of two comical bandits as they try to rob a bank while escaping from the angry cop. The graphics are simple but well designed and the reels are filled with imagery you would expect in your typical bank robbery. The game has a basic set-up with large, clear symbols that make the game easy to play. The playing card symbols ( 10, J, Q, K and A) in the game are the lower paying symbols and pay out between 50 and 150 coins for winning combinations of 5 of a kind. The Money Bag and Handcuff symbols both pay out up to 250 coins for 5 in a row. The two Bandit symbols pay out a maximum of 500 coins each while the highest paying symbol is the Cop which pays out a total of 1000 coins for 5 in a row. 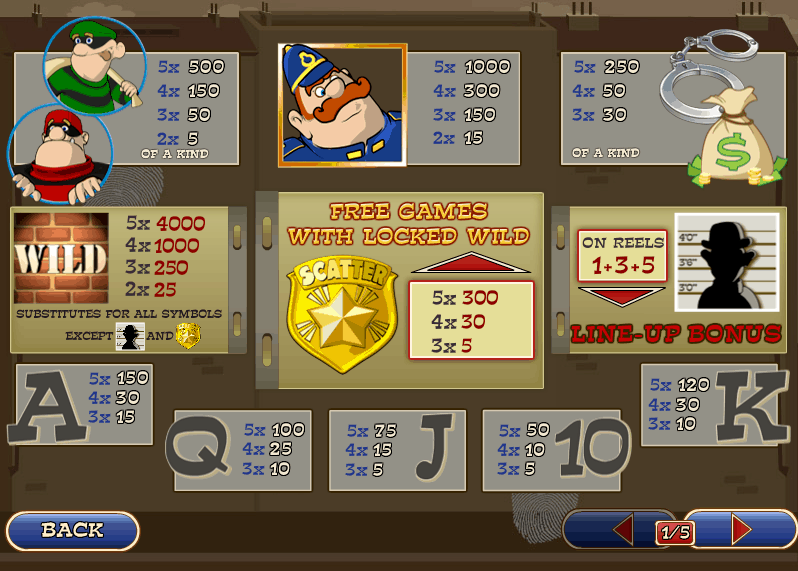 The Free Spins round is activated by landing 3 or more of the Cop's Badge Scatter symbols anywhere on the reels. If you land 3 Badges you will need to pick one of these badges to determine your number of free spins awarded. If you land 3 or 4 Badges you will get to pick two of the symbols and the number of free spins from each will be added together to get your free spins total. The Line-Up Bonus is activated by landing 3 of the Line-Up symbols on reels 1, 3 and 5 simultaneously. In this game, you will have to pick out potential criminals from a line-up. The aim of this game is to pick out the criminal as quickly as possible. In each game, the criminal will be different. The faster you pick out the correct criminal, the higher your prize will be. The Wild symbol in this game is the symbol labeled 'WILD' against a brick wall. This symbol can replace all the standard symbols in the game except for the two Scatters, thus creating more winning combinations in the base game. The Wild is also the highest paying symbol in the game and pays out 250 coins for 3 in a row, 1000 coins for 4 in a row and 4000 coins for 5 in a row. The Wild is the Brick Wall symbol who can replace all the Cops 'n Bandits symbols except for the two Scatter symbols. There are two Scatter symbols in this game. A Cop's Badge and a Line-Up symbol that each unlock separate bonus features. To trigger the game's free spin round, score three or more scattered bio weapon cylinders. Cops 'n Bandits is a great, little game by Playtech. Playtech turns this somewhat serious theme into something comical with its array of quirky characters. The graphics are clear and eye-catching with an upbeat soundtrack. The features in this game are quite unique and also have some of the classic slot features thrown into the mix. There is some good winning potential to be had with a relatively high RTP of 95.3%.